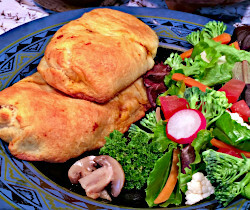 This easy recipe for pizza rolls is made with refrigerated dough, rounded out with a fresh salad on the side. Brown hamburger in a skillet over medium heat. Drain. Add tomato sauce and sliced mushrooms to browned meat. Add Italian seasonings, grated Parmesan cheese and lemon juice. Heat over medium-low. Open refrigerated rolls. DO NOT separate into triangles. Separate ONLY into rectangles. (One tube of rolls will make 4 rectangles). Sprinkle grated mozzarella cheese onto rectangles. Spoon meat and mushroom mixture onto one half of each rectangle. Starting at the meat-filled half of each dough rectangle, roll up from the narrow edge. Place on a baking sheet and cook in preheated oven for 10 to 15 minutes until golden brown.